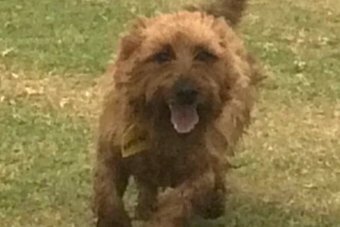 A crafty Australian terrier from outback Queensland has crossed 1,500 kilometres of the country, ending up in South Australia after stowing away in a passing truck. Laura Scudamore's dog Rusty had been staying with her in-laws on a cattle property outside Goondiwindi, on the Queensland and New South Wales border, while she and her family were on holidays. Earlier this month the three-year-old dog somehow managed to stow away on a truck stopped in the area. "Rusty's quite happy there [at the in-laws] but he makes a habit of sneaking off to the highway and trying to befriend people as they drive past," Ms Scudamore said. "He snuck down and apparently stowed away underneath this truck. "Thankfully Rusty had a collar on with a number for my in-laws." Ms Scudamore's in-laws were contacted and informed about the stowaway and are now trying to find a way to have Rusty returned. Funny thing is — this isn't the first time Rusty has pulled this kind of stunt. In late 2016 he made his way to Chinchilla, only 230 kilometres away from home. "So it's not completely surprising," Ms Scudamore said. "He's so friendly, that if someone pulls over he'll just happily jump in the car." Ms Scudamore is appealing for help on social media to help bring Rusty home. "I've been looking into dog couriers and they're quite expensive, so I'm trying on the off-chance that someone on my Facebook knows someone, and it's just gone crazy," she said. "The people who have him are really looking after him. They're sending us photos of Rusty down there. "We've just got to find a way home for him now." Down in Snowtown, Rusty has been in the care of Heather Reid and her family for more than a week. Her husband Paul McDowell was the truck driver who discovered Rusty in his cabin the day after New Year's Day, when he was 60km out of Goondiwindi. "He got up at 5am and was checking the tyres before he started off again, and there's this little dog sleeping [in the cabin]," Ms Reid said. "He had no idea where he came from, he was in the middle of nowhere. "My husband's a real dog man. He just said he couldn't leave him on the road, he'd die." Mr McDowell looked in the immediate area for the owner, but there was no one around. "He went walking miles up the road but couldn't find a house, it was just bush. "He said, 'all right, I'll just have to bring him with me'." From there the pair had a four-day trip together back to South Australia. Ms Reid said while Rusty was safe and well with her family having a "grand old time", she was working with Ms Scudamore to get their pet back to Queensland. "We're trying to get Rusty home. I wasn't going to stop until I found Rusty's home, we knew he was something special because he's a special little guy. "You could just tell he's got a family." Ms Reid said the timing of Rusty's arrival was serendipitous. "We just lost a dog … we were heartbroken. Next thing he's got this little dog keeping him company. "It took our minds off what had just happened to us." Awwwww. What a cheeky little guy. Glad he’s safe. Rusty made his way to South Australia earlier this month, while his family was on holidays, by stowing away in a truck driver’s carriage. Truckie Paul McDowell took Rusty home to Snowtown where his family took care of him while waiting to reunite him with his owners. Rusty’s first night home on his cattle property consisted of cuddles from the Scudamore children, Eliza and Sam, and some tasty bones picked out by Eliza to welcome him home. The three-year-old canine captured the heart of the nation and made a special celebrity appearance at school this morning. Laura Scudamore said the family had struggled to understand why everyone was so interested in Rusty, but had come to understand people liked stories with a happy ending. “People in Goondiwindi are happy to be in the news for a good reason. Rusty loves the attention and seems to be quite happy to pose for photos wherever he goes,” she said. His journey back entailed a courier from Snowtown to Adelaide, a flight from Adelaide to Brisbane and finally a four-hour car ride from Brisbane to Goondiwindi. “The trip home was all care of Jetpets, we are so grateful to them,” she said. The Snowtown family believed Rusty was sent to help them in a hard time. On New Year’s Eve their dog was hit and killed by a distracted driver who was talking on his mobile phone. Mr McDowell’s partner, Heather Reid, said Rusty’s infectious personality brightened up their home. “We miss Rusty already,” she said. Rusty’s thirst for adventure was well and truly quenched during his Snowtown sojourn, which included his first trip to the beach. “He was just amazed by the beach,” Ms Reid said. Now the family has decided it will buy an Australian terrier. If you want to keep abreast of Rusty’s adventures you can follow him on Instagram or wait until Rusty’s aunt Sally Scudamore releases her children’s book. “She had already started writing a book on Rusty last year... now she has lots more to add to it,” Mrs Scudamore said.